A cookbook by Michael Rantissi & Kristy Frawley. Recipes from our restaurant Kepos Street Kitchen located at 96 Kepos St, Redfern NSW 2016, Australia. In a large bowl, soak the chickpeas and broad beans overnight in cold water, changing the water at least twice during this time. Drain the chickpeas and broad beans and put them in a food processor with the coriander, parsley, onion, chilli and garlic. Whiz until grainy (not a smooth purée). and sesame seeds. Mix together and, using a falafel spoon or two tablespoons, quenelle the mixture or roll it by hand into 20 patties. Working in batches, drop the falafel into the oil and deep-fry for 3 minutes, or until golden. Remove the falafel with a slotted spoon and drain on paper towel. Serve with green tahini or hummus. My green tahini is a take on the classic tahini – which is whiter in colour – and is used as a dressing, dip or a complement to hummus. The addition of more herbs in my version gives it a vibrant green colour, as well as a grassier flavour and fragrance that works well with many dishes. In a food processor, blend the coriander with 100 ml (3½ fl oz) water until you have a smooth green paste; don’t over-blend as the coriander will go black. Add the lemon juice, garlic and tahini and blend until smooth. Stir through the sea salt flakes. An easy dish because each of the elements can be prepared in advance and assembled trifle-style when you’re ready for breakfast or brunch. Put the couscous, olive oil and ground cinnamon in a stainless steel bowl and mix well. Pour over the boiling water and cover the bowl tightly with plastic wrap. Set aside for 10–15 minutes. a simmer. Cook for 15 minutes. Remove from the heat. When the water has been absorbed, remove the plastic wrap and fluff up the couscous with a fork. Put the yoghurt, icing sugar, Turkish delight and saffron in a bowl and mix to combine. Keep the elements in their separate bowls in the fridge until ready to serve. To assemble, use glasses or jars so that you can see the layers. 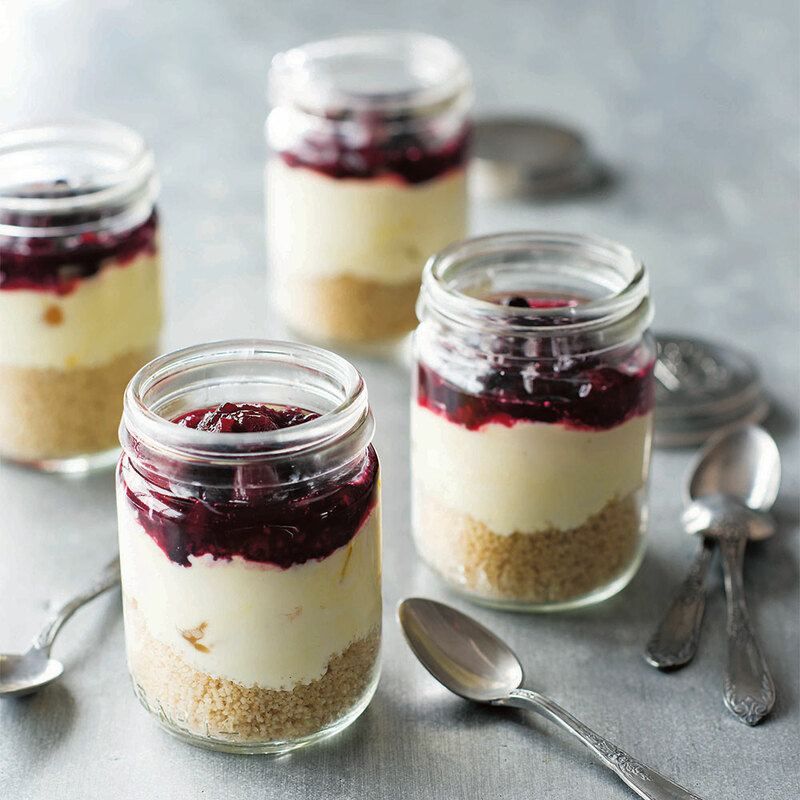 Put 2–3 tablespoonfuls of the couscous in each glass, then spoon in the yoghurt mixture and top with the berry mixture. There is nothing that chicken soup can’t heal, it is said, and it’s one of those dishes you can eat at any time of the day. To make the stock, put all of the ingredients in a large saucepan with 5 litres (175 fl oz/20 cups) water. Cook over medium heat for 45 minutes. Remove the saucepan from the heat and transfer the chicken to a chopping board. When cool enough to handle, pull the chicken meat off the carcass and shred with your hands. Cover and set aside until you are ready to serve the soup. Discard the chicken carcass. Strain the stock and set aside. Discard the vegetables. To make the soup, put the olive oil and garlic in a large saucepan over medium heat and cook for 1–2 minutes. Add the leek and cook for 3–4 minutes. Add 1 litre (35 fl oz/4 cups) of the reserved chicken stock. Turn the heat up to high and bring to the boil. Add the noodles and cook according to the packet instructions, or approximately 5 minutes, stirring from time to time. Add the shredded chicken to the noodle stock and cook for 4–5 minutes, just to warm through and meld the flavours. Season with sea salt and white pepper. Stir through the parsley and serve. It is so easy to put this dish together, and yet it makes such a big impact with its sharp, clean flavours. Put the olive oil and dukkah in a large bowl and mix together. Add the lamb and rub the dukkah mixture into the meat. Cover the bowl and transfer to the fridge to marinate for 30 minutes. To make the salad, put the mint, pomegranate seeds and preserved lemon in a bowl. Shake together the lemon juice and olive oil in a small jar. Pour over the salad, toss gently and season with salt and freshly ground black pepper, taking care not to use too much salt as there is salt in the dukkah on the cutlets. Heat the barbecue to high or heat a chargrill pan over high heat on your stovetop. Cook the lamb cutlets for 2–3 minutes on each side. Remove the pan from the heat and rest the lamb for 5 minutes before serving with the mint and pomegranate salad. Dukkah can be kept for up to a year – but I am sure you will eat it all before then! It is best stored in an airtight container in a cool, dry place. Put the hazelnuts on one baking tray, and the coriander and cumin seeds on a separate tray, and bake until toasted, approximately 15 minutes. After the hazelnuts and seeds have been in the oven for 10 minutes, add the sesame seeds on a separate tray and toast for the remaining 5 minutes, or until lightly coloured. Remove all the trays from the oven and allow the nuts and seeds to cool to room temperature. Put the hazelnuts in a food processor and pulse to a coarse breadcrumb size. (You could also crush the hazelnuts the traditional way using a mortar and pestle – good exercise for the biceps!) Transfer the hazelnuts to a large mixing bowl. Add this powder to the bowl along with the toasted sesame seeds, salt and pepper. Mix well using a wooden spoon. Eggplant is a staple in the Middle East and is used in many ways there. This is a lovely side dish to have at a barbecue or to serve with grilled fish. You can also prepare it as a delicious salad (see note below). Place the eggplant halves, cut side up, on serving plates. Scatter the rocket leaves over. Combine the yoghurt, garlic and olive oil in a bowl and spoon the mixture over the eggplant and rocket leaves. Season with salt and freshly ground black pepper. NOTE To make this as a salad in a bowl, leave the eggplants whole and roast on a hot barbecue until their skins blacken. Once the eggplants are cool enough to handle, peel the skins off and discard. Tear the flesh into chunks and put in a bowl with the rocket leaves. Season with salt and freshly ground black pepper. Combine the yoghurt, garlic and olive oil in a small bowl. Add to the salad, toss gently and serve. Beautifully moist and with the real taste of almonds, this cake can be made in advance for a dinner party, or enjoyed for afternoon tea. It keeps refrigerated for up to a week, but I’m not sure it will last that long. Preheat the oven to 170°C (325°F). Grease a 24 cm (9½ inch) spring-form cake tin and line the base with baking paper. Put the eggs in a large bowl and whisk with a fork. Add the butter and mix until combined. Put the almond meal, coconut, sugar, salt and vanilla bean seeds in a medium bowl and mix to combine. Add the almond meal mixture to the egg mixture and mix well. Pour into the cake tin and scatter the almond flakes over the top. Bake for 45 minutes, or until the cake is firm and golden brown. Cool the cake in the tin on a wire rack for 10 minutes. Remove the spring-form ring and allow the cake to cool completely.